Date | Time Wednesday, Nov. 1 | 7:05 p.m.
Saginaw, Mich. – The Flint Firebirds begin a busy week of three games in four nights, starting in Saginaw on Wednesday, for the first installment of the I-75 Divide Cup presented by Coors Light. Puck drop is set for 7:05 p.m. at the Dow Event Center. Then, the Firebirds return home for a pair of games against the North Bay Battalion on Friday night and the Guelph Storm Saturday night. Wednesday marks the first-of-eight games between the two rivals this season and first-of-four games in Saginaw. Flint has posted shut-out wins over Saginaw in their two opening meetings over the past two seasons. The Firebirds, in their inaugural campaign in 2015-16, opened up the regular season white-washing the Spirit in Saginaw 3-0. The two teams then began the 2016-17 season in Flint, with the Firebirds blanking the Spirit 4-0. Flint leads the all-time series with a 10-4-0-2 record over Saginaw in the past two seasons. The Firebirds are 4-4-0-0 at the Dow Event Center and are 6-0-0-2 on home-ice at the Dort Federal Event Center in Flint. This season, the Firebirds are 2-4-1-0 on the road, while Saginaw is 3-4-1-0 at home. Flint sits two spots ahead of the Spirit in eighth-place in the Western Conference. Saginaw has eight points in 13 games, while the Firebirds have 13 points in 14 games. Flint is 3-0-0-0 when leading after one period of play and is 2-1 in one-goal games this season. On special teams, Flint is 12th out of 20 OHL teams on the power-play, scoring at 16.7%. The Firebirds have scored 11 goals with the man-advantage, which includes at least one power-play goal scored in nine of their 14 games this season. Flint is operating at 68.2% when shorthanded. The Firebirds have scored four shorthanded goals in 11 games and are tied for fourth most shorthanded goals scored in the OHL this season. The Spirit are currently last in the OHL on the power-play converting at 9.7% and are 18th overall on the penalty-kill at 72.7%. Flint Firebirds Head Coach Ryan Oulahen has been selected as one of three head coach’s to lead Hockey Canada’s three teams at the World Under-17 Hockey Challenge, Nov. 5-11 in Dawson Creek and Fort St. John, B.C. Along with Coach Oulahen, Firebirds’ goaltender Luke Cavallin and forward Ethan Keppen were among the 66 players Hockey Canada chose to represent their nation. Vice President of Hockey Operations & General Manager Barclay Branch is also involved as the Ontario area scout with Hockey Canada. Firebirds Head Coach Ryan Oulahen will lead Canada White, which Firebirds’ forward Ethan Keppen will also be on and Goaltender Luke Cavallin will tend the net for Canada Red. While Cavallin is gone, the Firebirds have called-up goaltender Evan Morrison from the St. Marys Lincolns of the Greater Ontario Junior Hockey League (GOJHL). Morrison was selected by the Firebirds in the 15th-round of the 2016 OHL Priority Selection. A total of 23 OHL players were selected and are divided into three teams representing Team Canada Black, Team Canada Red, and Team Canada White and compete against the Czech Republic, Finland, Russia, Sweden, and the United States in their quest for a gold medal. Oulahen, Cavallin and Keppen will be gone from Oct. 30 to Nov. 13 and will miss five games, returning back for the Nov. 15 home game against Sarnia. Fans can stay up-to-date on the schedule, roster, and stats by clicking here. 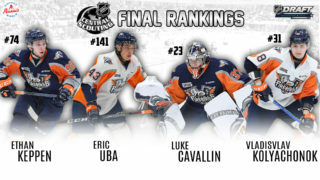 The Flint Firebirds have three players currently among the league leaders in various stats. Ty Dellandrea is tied for second in the OHL with three game-winning goals. Goaltender Garrett Forrest is tied for 10th in wins with six victories and Ryan Moore sits 12th in the OHL with 11 assists. This weekend’s play saw three Firebirds earn their first’s of the season. Forward Ryan Littlejohn had both his first goal and first assist of the season both coming in Sunday afternoon’s game against the Sarnia Sting. In the same game forward Jack Phibbs scored his first goal of the season and rookie Kyle Harris registered his first-career OHL point, an assist against the Sting. In his first game against his former team the London Knights, Nicolas Mattinen (Toronto Maple Leafs) registered an assist and has nine points (2G. 7A, 9P) which is one point away from his OHL career best of 10 points which came in his rookie season in 2015-16. Ryan Moore had an assist this weekend and now leads the Firebirds in assists with 11 and points (4G, 11A) with 15. Nick Caamano (Dallas Stars) had a goal and an assist over the weekend and is now third in team scoring (5G, 8A) with 13 points. In net, Garrett Forrest has a 3.99 goals against average (GAA) and a .883 save percentage (SAV%). Luke Cavallin, made two relief appearances this weekend against the London Knights and the Sault Ste. Marie Greyhounds. Cavallin stopped a total of 24 shots in those two games. NHL: The Firebirds have three players that have been drafted by NHL teams consisting of Nick Caamano (Dallas Stars), Fedor Gordeev (Toronto Maple Leafs) and Nicholas Mattinen (Toronto Maple Leafs). Additionally, Dennis Busby, Ty Dellandrea, Hunter Holmes, Ryan Littlejohn, Evan Morrison and Jack Wismer are six first time eligible players to be selected in the NHL Entry Draft in June 2018. Busby, Dellandrea and Holmes were listed among NHL Central Scouting’s October ‘Players to Watch’ list for the 2018 NHL Draft in June. Marcus Crawford is the Spirit’s leading scorer with 12 points (3G, 9A) in 13 games. Over this past weekend, Crawford moved into eighth on the team’s all-time assist leaders with 95 career-assists and is now 23rd in all-time team points with 108 (13G, 95A) passing T. J. Brodie (Calgary Flames). Cole Coskey leads the Spirit in goals with seven this season. Damien Giroux is the second leading scorer for Saginaw with 11 points (6G, 5A). Brady Gilmour (Detroit Red Wings) is fourth with eight points (3G, 5A). Between-the-pipes, Evan Cormier (New Jersey Devils) has backstopped Saginaw to all three of their wins this season and currently has a 3.15 GAA along with a .903 SAV%. 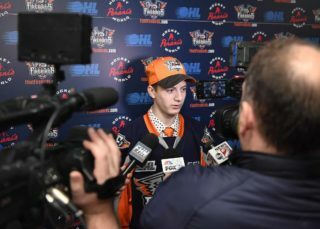 On Monday, Saginaw completed a trade that sent backup goaltender Brendan Bonello to the Kingston Frontenacs for a sixth-round draft pick in the 2019 OHL Priority Selection. Bonello had appeared in one game for the Spirit this season and over the course of his three year stay with the team, had a record of 3-13-2 with a 4.79 GAA and a .850 SAV%. Cameron Lamour has played two games for Saginaw this season and now becomes the Spirit’s backup goaltender. NHL: Three players on Saginaw’s roster have been drafted and/or signed by NHL teams consisting of Evan Cormier (New Jersey Devils), Brady Gilmour (Detroit Red Wings) and Keaton Middleton (Toronto Maple Leafs). Eight notable NHL players from the Saginaw organization are Paul Bissonnette (Arizona Coyotes), T.J. Brodie (Calgary Flames), Ben Chiarot (Winnipeg Jets), Dalton Prout (Columbus Blue Jackets), Tom Pyatt (Ottawa Senators), Brandon Saad (Columbus Blue Jackets), Chris Thorburn (Winnipeg Jets) and Vincent Trocheck (Florida Panthers). Wednesday evening’s contest against the Saginaw Spirit can be heard live on the radio throughout Flint & Mid-Michigan on US 103.1 FM, online at www.us103.com or by downloading the US 103 app here. Dominic Hennig will call the play-by-play action on the Flint Firebirds Hockey Radio Network. Pregame coverage will begin 30 minutes prior to puck drop at 6:35 p.m.
Wednesday’s game against the Spirit will also be televised live province-wide throughout Ontario on the OHL Action Pak on channel 450 for Rogers TV cable subscribers and channel 494 Cogeco TV cable subscribers. OHL fans with cable television in Ontario can add the OHL Action Pak to their television plan to catch the Firebirds in action, home or away all season long. Along with Wednesday’s game, 64 of the Firebirds’ 68 games throughout the 2017-18 season are also scheduled to be televised live across the province of Ontario on the OHL Action Pak. All Flint Firebirds home and away games throughout the 2017-18 season can be watched anywhere in the world online on www.ohllive.com or on the OHL Live app. OHL Live is a league video streaming platform that delivers high quality live and on-demand coverage of all regular season and playoff games annually. 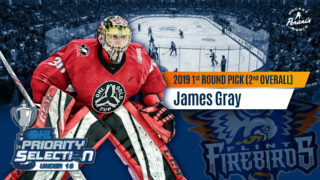 The cost is $6.99 per game, $69.99 for Flint Firebirds away games only, $179.99 for all 68 home and away Firebirds games and $279.99 for all 1,360 OHL games throughout the 2017-18 season. Single game tickets for the Flint Firebirds 2017-18 season are $12 for Bronze, $16 for Silver, $20 for Gold and $26 for VIP seating. All seats are reserved / assigned seating. Fans can purchase tickets at the Dort Federal Event Center Box Office and online at ticketmaster.com. For ticket information, flex tickets or group outings, contact Dominic Gutierrez at (810) 701-8536 or domg@flintfirebirds.com. To book a private suite, please contact Karla Turner at (810) 744-0580 ext. 213 or email karla@flintfirebirds.com.